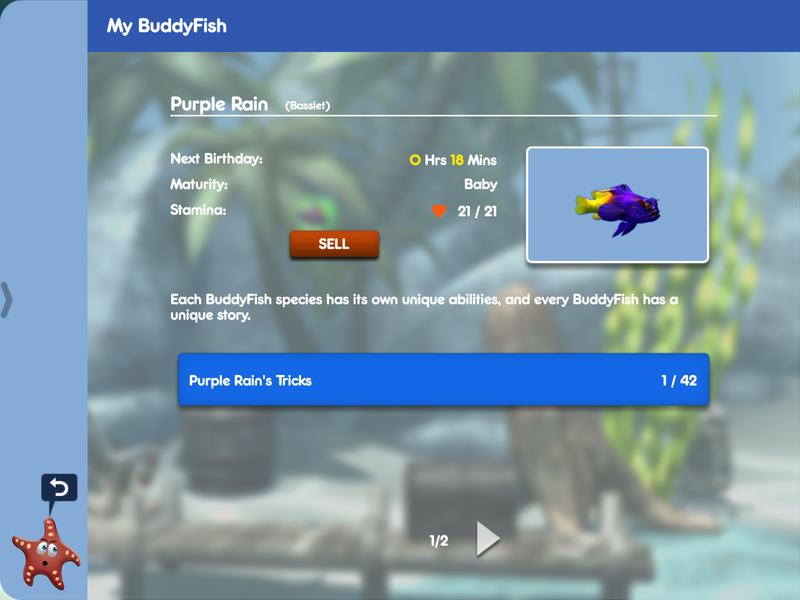 In TouchFish there is more to handling your BuddyFish than simply feeding, playing, and Trick performances. If you want to get a bit more advanced, especially if you have more than one Buddy, you’ll find some handy tips here. Tapping on the widget opens the Journal to your Buddy’s info page. Here, you can see your Buddy’s name, species, when the next Birthday will come, Maturity, and Stamina. Birthdays are good to keep track of because each time your Buddy has a Birthday, maximum Stamina will increase and you’ll get a chance to pop some birthday balloons for a nice reward! Make sure to keep your Buddy well fed, because if the Buddy goes hungry, progress to the next Birthday will stop until that belly is full again! The Buddy’s Maturity just lets you know what stage of life has been reached, which only affects the look of your Buddy. Notice that you can also sell your Buddy on this page. Be careful, as this action cannot be undone! You will get hefty rewards if you choose to let your Buddy go off on other adventures, though. More experienced Buddies give bigger rewards. Simply tap on the Tricks button to access your Buddy’s tricks (obviously), but take a moment to notice that on the right side of the Tricks button, there’s an indicator of how many Tricks your Buddy knows, giving you a quick glance at your Buddy’s Trick progress. If you own more than one Buddy, you can tap on the arrows at the bottom of the page to check out other Buddies. 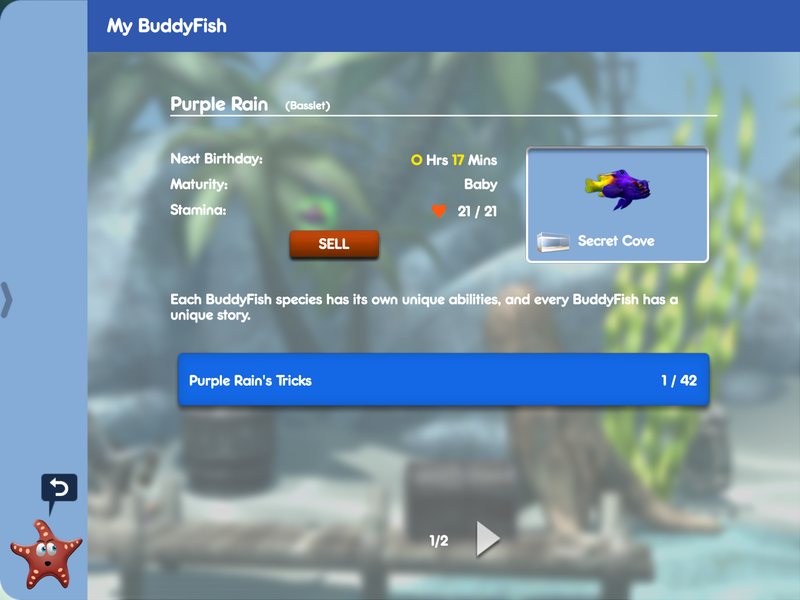 Note that if you navigate to another Buddy’s page and then leave the Journal (by swiping inward from the left side of the screen), that Buddy will be swapped into your tank. So it’s a quick and easy way to swap out Buddies: tap the Buddy, then the menu widget, then simply flip through your Buddies’ pages to the Buddy you want, then close the Journal! Now, that Buddy will stay in that tank even if you choose to go to another tank. Every Buddy you own can be Pinned to a tank. You can also Unpin a buddy by simply tapping that Buddy’s image again in the Jounral. That Buddy will then once again follow you wherever you go. Whether a Buddy is Pinned or not, the Buddy in the tank you are currently looking at will join you in Minigames and will come along to visit other players. Now you have the knowledge to examine, swap, and Pin Buddies to customize your experience to suit your needs! ← Check out Pocket Gamer’s interview about TouchFish!